August is marked by health issues – clear signs that I have taken very little care of myself. I have gained back all the weight I’ve lost during those bouts of weight-loss regimens over the past couple of years. Thing is, I’m already in my mid-20s and that’s the age range where it’s critical to get fit. For the past seven months, I’ve been immersing myself into the whole making money thing that I’ve entered another phase of sedentary living. I practically spend all my waking hours in front of a computer even eating breakfast, lunch and dinner in front of the monitor. Sure, the money’s good from all the projects but August served as yet another warning that earning big bucks is moot if you’re going to spend it all away on health care. So here I am again trying to re-assess my short-term goals health-wise. My stepper machine and sit-up bench are both gathering dust particularly because I’ve grown bored with them. I used to play basketball but since I don’t live in a secluded neighborhood where I can use the community ballpark by myself anymore, that too isn’t a viable option. I practically live very near one of the best jogging venues in the whole metro – UP Diliman – and I haven’t even tried going jogging around the academic oval ever since I moved. That’s where the realization sank in – I might have to take up jogging. So does this mean I’m jumping into the burgis-yuppie bandwagon? No offense to them runners (I now envy all the other people who have been in the whole running craze who are now able to run 5 to 10k marathons) but running has grown to be a fad nowadays, hasn’t it? To some extent – yes – since I’m taking it at the height of the fad. But with most of my efforts, I’m doing it for myself. I want to look and feel my best by the time I hit 26 which isn’t exactly that far away. The good thing about running being a fad is that there are now a lot of specialized gear that can be had. I’ve never really given much thought about quality of gear previously but since I’m not exactly in my destitute years, recently, I decided to go with specialty gear. I used to just settle for the cheap Fila shoes since they practically cost 1/3 of what you’d normally pay for some higher-end stuff but having the capitalist mentality recently convinced me that there’s a reason why you pay a premium for the good stuff. Since I was looking for special gear, I decided to visit a running store. Mainstream sports stores like Toby’s and Olympic Village can’t quite provide the guidance and know-how when it comes to most sporting activities. Just so happened that there’s a running located just a couple of blocks from my place – Second Wind Running Store. Hector, one of the guys who runs the shop, is probably the shoe salesman that puts every other shoe salesman to shame. Being a runner himself, he really knows what shoe is recommended for different cases. Unlike most businessmen who are out to get the most buck out of the customer, he’s there to get you the right shoe even if it’s not the most expensive one around. In my case, I have flat feet and knee problems so Hector recommended shoes that provides both stability and cushioning. 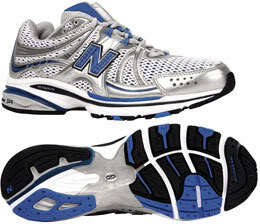 The store carries three brands – Mizuno, Asics, and New Balance but most of the stability models were from New Balance. It came down to three choices (749, 758 and the 769) and Hector let me try out each pair on a treadmill to see which ones “felt” best. Eventually ended up with the New Balance MR 769 SB since it’s light, provides amble cushion and gives extra support for my paa ng lampa. Broke the pair of shoes just as soon as I got home and by jeebus, I can notice the difference. Cliche as it sounded – I knew where the extra Php 3,000 (compared to my old Fila pair) went. Did a short walk/jog around the block for a good sweat session. Tomorrow, I might be starting with the Fat Man Chronicles – cause every fat man, there’s a fit man waiting to come out. Second Wind Running Store is located at 88-C Maginhawa St.â€¨, Teachers Village, Quezon City.